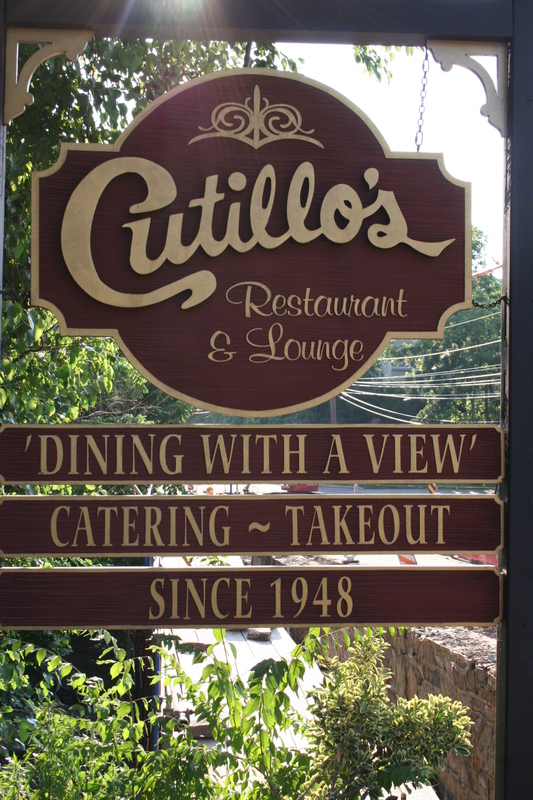 Cutillo’s Restaurant in Sanatoga, PA (near Pottstown) is a spot that my wife and I have visited a few times over the past couple of years. Our son, Brian and his wife, Jenny, live(d) in that area and this is why we found ourselves there for a Father’s Day dinner. It was probably going to be our last trip out that way as they were moving back to New Jersey the following week. Although we had made other visits to this dining spot, most had been for drinks and snacks or a buffet type meal following a special event. This was our first “dinner” at Cutillo’s. 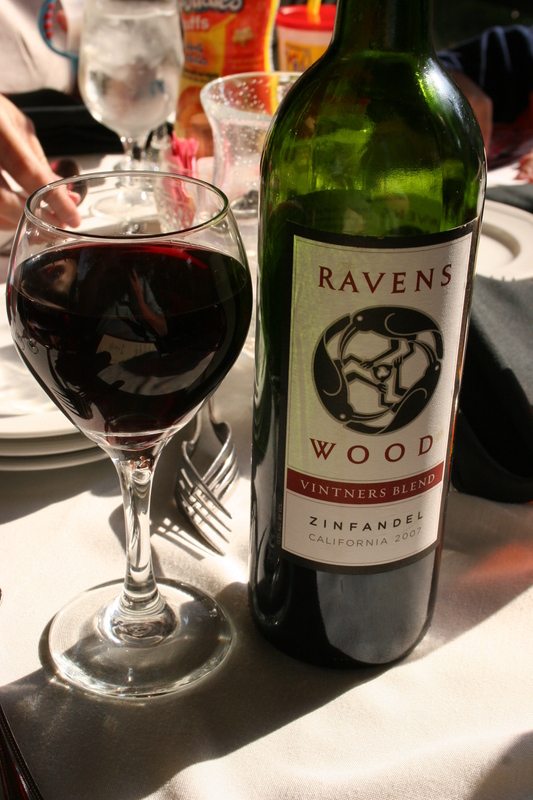 Our server, Drew brought us menus and we ordered a bottle of 2007 Ravenswood Zinfandel. At $20.00, this was not a bad price for a restaurant wine list even though it’s not a very special wine. We decided to skip the appetizers and we all started with a Wedge Salad, iceberg lettuce with tomatoes, bacon bits and blue cheese dressing. The salad was not bad but having enjoyed some great wedge salads this one wasn’t near the top of the list. It’s tough to be as sympathetic to the entrees. 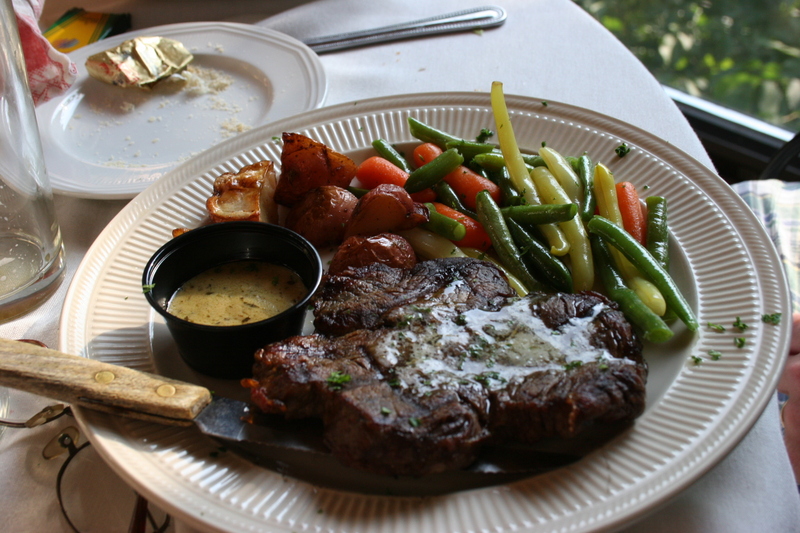 My son, Brian, chose the Filet Mignon, “9 ounces of tender filet cooked to your liking and topped with béarnaise sauce.” When his filet arrived it was not a very impressive looking piece of meat and he even asked me “is this a filet?” It wasn’t a very good looking piece of meat and for $28.00 this was certainly overpriced for the quality. His wife, Jenny, fared no better with her choice, which was very nearly my choice as it sounded wonderful on the menu. 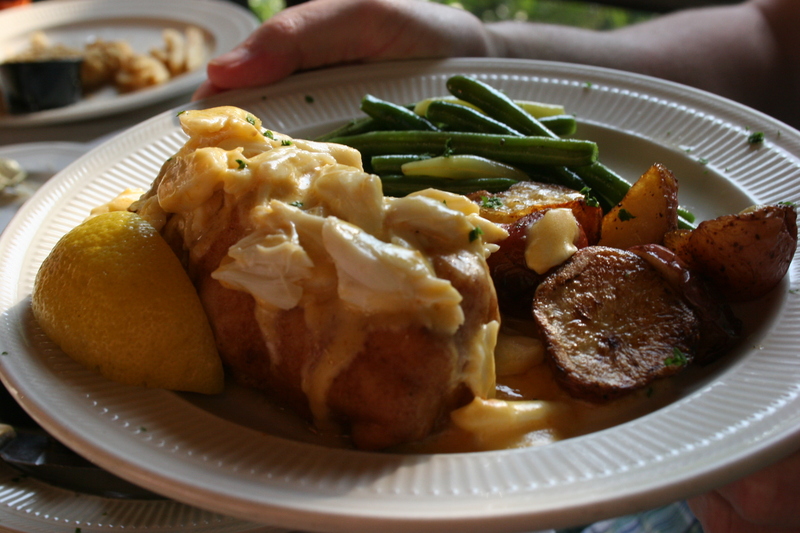 She ordered the Chicken Esquire, chicken breast wrapped around jumbo lumped crab imperial filling, deep-fried and baked then smothered with jumbo lump crab lobster cream sauce. As I’m typing this I am almost wishing I could order it except that the memory of the dish lingers in my mind. Whatever that “sauce” was it quickly congealed over the tasteless chicken breast and was not very appealing. I would have been exuberant over the fact that I did NOT choose the Chicken Esquire except that I chose the equally bland Vermicelli and Meatballs. The online menu had shown it to be angel hair pasta but, although I was originally disappointed to find they had substituted the vermicelli, the truth is it wouldn’t have been any better. It was the sauce that killed it. 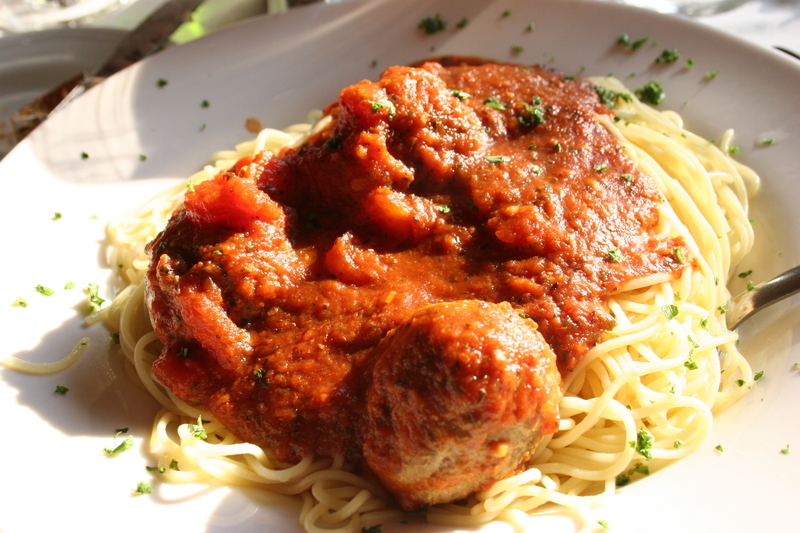 Actually, the meatballs sent it to the hospital and it was the sauce that made it necessary to pull the plug on the entrees life-support system. I ate about one-third of the dish and had no desire to bring the rest home. 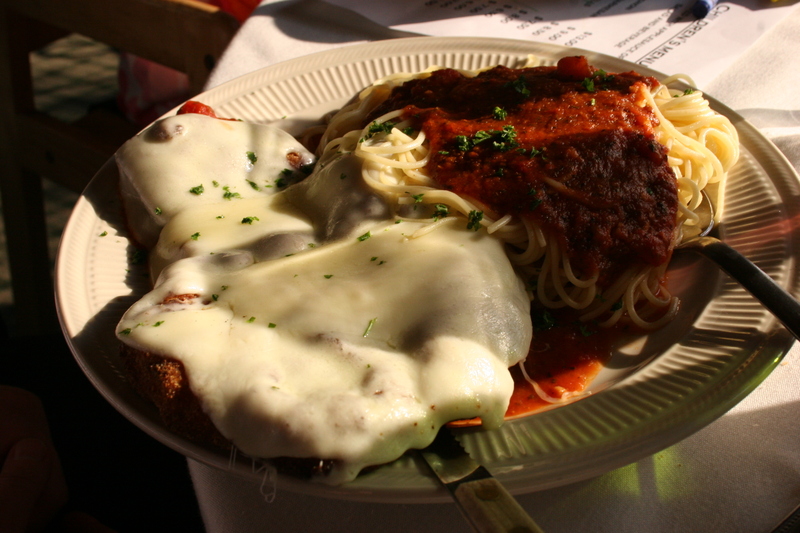 My wife, Kathy, found her Chicken Parmesan with a side of vermicelli just as dull as the rest of our dinners. To be fair, the kids were a little bit fidgety and that may have put a damper on the entire experience but that in no way hampered Cutillo’s ability to cook their food. It’s always been my policy to try and say good things about every dining experience but I’d have to say we were all very disappointed with our dinner at Cutillo’s.